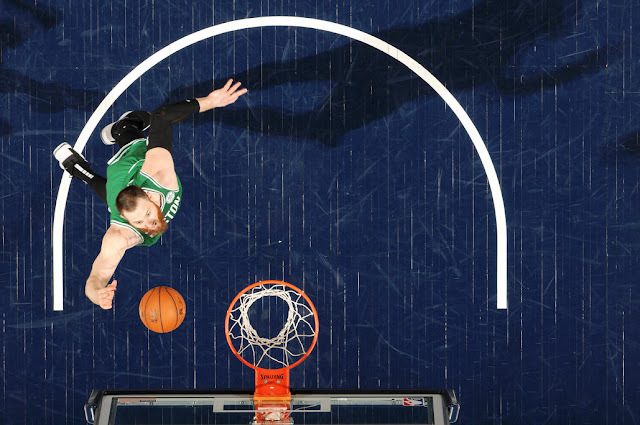 The Boston Celtics now find themselves free and clear in possession of the East's fourth-place position with their 117-97 win over the Indiana Pacers, the team they'll almost certainly be playing in the first round of the 2019 NBA Playoffs. The win all but assures they'll retain home court advantage against the Pacers, and edges them a little closer to the unlikely potentiality of jumping the Philadelphia 76ers for the conference's third seed in postseason play. The game stayed close throughout the first quarter, with Boston gaining a little separation towards the latter half of the second frame as they increasingly were able to capitalize on the Pacer's defensive mistakes. Behind big nights from Gordon Hayward (21 points and looking very aggressive), Jayson Tatum (22 points, 7 boards), and Kyrie Irving (17 points and 6 dishes), again bolstered by another double-double from All of Australia (a.k.a. Aron Baynes, who logged 11 boards and points each), Boston showed itself to be legitimately rounding into the form we'd been hoping to see all season. The Celtics still have a game left to play against the Orlando Magic on Sunday, and close out the season against the Washington Wizards on Tuesday; a win over both and two losses out of the 76ers three remaining games could elevate Boston's standing even further. For now, however, the priority shifts to remaining healthy going into the postseason with the fourth seed likely secured, so don't expect full compliments on either of the Cs' remaining two games.